I try to be polite and call slums ‘low-income areas’ or ‘low-income communities’. Many of the people in NGOs sometimes just call them ‘areas’, and because we all know the kind of communities they work in, we know ‘areas’ mean ‘slums’. But I haven’t found another viable word to replace ‘slums’, and especially when you talk to people that are not that familiar with English and you start throwing around phrases like ‘low-income communities’, it can get confusing really fast. So I have just given up and call them slums so everyone is clear on what I do and where I’m going. Slums obviously have a notorious reputation in India. When I started working with the domestic workers and visiting them in their homes in 2010, I had no context for it except what I read about poverty issues in my Political Science and Sociology textbooks. As I tried to work with student translators to interview domestic workers for the research, the reaction of some of the female students surprised me. I wasn’t prepared for the strange stereotypes they held of these communities I had become so familiar with. Later on I was told that in Bollywood films, the slum areas are portrayed as these intrinsically dangerous, violent and lawless places, and that maybe the students were reacting to those images. Although I know slums are not the safest areas, whenever I visited I saw a community of people with kids playing outside, women chatting with each other, and people sitting outside their homes – the same as anywhere else. However, I haven’t ever walked into a slum without being led there by someone who knew the community, or if I went there alone, I would already know people and know where I was going. 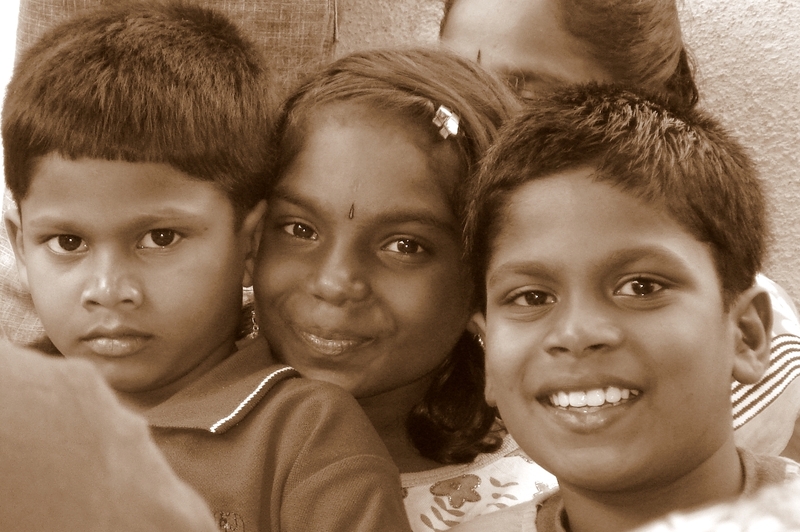 But that changed when I went looking for the three kids whose faces are on our facebook and twitter page: Johncy (the girl in the middle), Bharith (the boy), and Nandakumar (the little boy). They are an extended family with lots of cousins that I met when I was doing my original research in 2010. 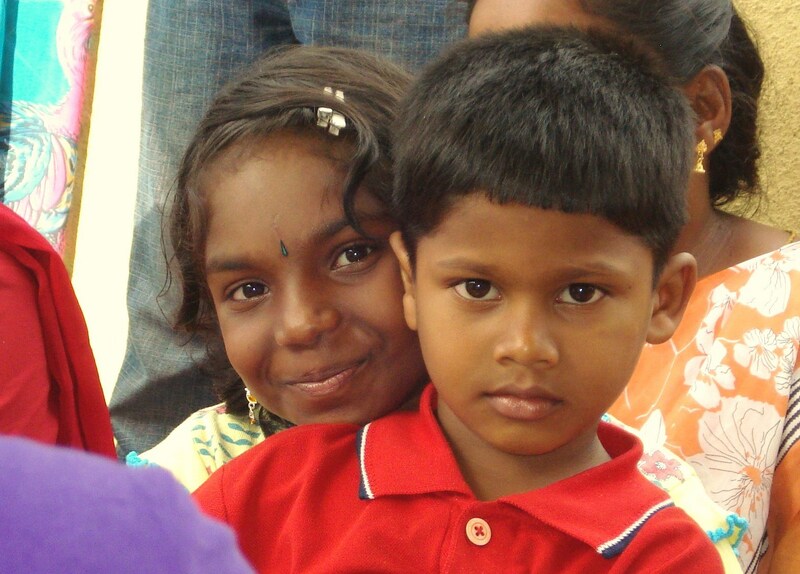 Out of all the children I met the first time I was in India, I remembered these kids the most clearly. Even though we couldn’t speak each other’s languages, somehow the entire time they kept on chattering away to me, holding my hand and laughing. When I showed their photos to some of the people I used to work with, they said, “Ohhh… they are going to be hard to find.” One of the women knew the general area where Johncy lived, but that is all she could tell me. At that point, I think I suddenly realized that there’s a certain segment of the population that can just disappear into the crowds and you will never see or hear from them again. I knew then that if I didn’t go and find her myself, that would be it, they would be memories and I would never know what happened to them. Slums can be intimidating areas, and the invisble line that separates “slum” from “non-slum” can be a very difficult line to cross. But I had been to so many slums that I knew generally what to expect, so when I went looking for Johncy, I just went to the boundary of what I thought was the right slum, and walked up to a group of people sitting outside and talking to each other, and I said, slightly sheepishly, “Hi!” The people there looked at me, surprised at first, then suspiciously. I asked if they knew Johncy, and I described what she looked like. They looked confused, asking if I knew the local language Kannada, and when I said no, they would ask if I knew Hindi. When I also said no, one man asked, slightly amazed, “English only? ?” They did not look pleased. But when they finally figured out I was looking for a person from their community, they became super helpful and would enlist friends who spoke English to come talk to me. As they were trying to figure out who Johncy was and if anyone knew where she lived, they became curious, asking, “Why? Why are you looking for her?” I didn’t really know how to answer that except to say she was part of the work I was doing with a NGO. They would ask the name of the parents, they would ask what kind of work the parents did and then they would lead me into the slums and down narrow walkways to meet people who kinda sorta fit that description. At some point they realized I was in the wrong slum and had to cross the street. I was confused because some slums are huge and take up several city blocks. In this neighborhood, it seemed like each slum was a small block that had a different name. But I finally found the right area, and was led by a sweet, older woman who zig-zagged through the tight lanes with lightning speed. But she couldn’t figure out who Johncy was, and that day the weather had decided to change from a comfortable 28 degrees to creep up towards the mid-30’s. I was tired and exhausted and overwhelmed and not sure what to do next. In the year and a half since I met her, she had learned English, and her confidence had just grown. She was funny and talkative and full of energy. She gave me the cell phone number of her grandmother and her cousin, and we agreed to meet the following week. Jen, you are a wonderful writer! I am so happy that you were finally able to reconnect with Johncy! Did you get to see her often after this reunion? It sounds like the slums are not such a bad place, did you see much violence such as is depicted in Bollywood? It seems that you were comfortable enough to just wander through and were helped and welcomed rather than made to feel unsafe. Thanks Nicole! I’m going to have a Part 2 to this story in the next few days, and will be keeping in touch with Johncy and her extended family. I haven’t actually watched a lot of Bollywood films so I’m unclear how slums are depicted, but although I realize slums are not the safest places, I think that violence is usually perpetrated towards people who are already from those communities – domestic violence, criminal life, people owing to what they call ‘moneylenders’. In general, people won’t attack a couple of outsiders minding their own business unless they’re a little un-hinged. You do need to exercise some caution, but generally I’ve experienced a warm, hospitable community. I love that you were able to build such a connection with the children there. I think the best part of travelling to countries like India, for me at least, is connecting with children because their innocence and ambition for life is still so strong and inspiring. I feel that building a bond with them at that age and continually following up with them, like you’ve done, can be an imperative part of their learning experience in terms of pursuing their dreams beyond what society expects them to do. I’m looking forward to reading your follow-up post about Johncy!